Israeli forces continued with systematic crimes, in the occupied Palestinian territory (oPt), for the week of 12-18 July, 2018. Israeli forces continued to use excessive force against Palestinian protestors in the Gaza Strip. Two Palestinian civilians, including a child, were killed, while a civilian succumbed to his previous wounds. 115 Palestinian civilians, including 24 children, 5 women, 4 journalists and 3 paramedics, were wounded; 15 of them sustained serious wounds. 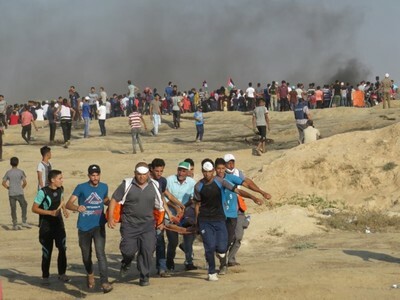 Israeli forces continued to use lethal force against Palestinian civilians, who participated in peaceful demonstrations organized within the activities of the “Great March of Return and Breaking the Siege” in the Gaza Strip, which witnessed for the 16th week in a row peaceful demonstrations along the eastern and northern Gaza Strip border area. During the reporting period in the Gaza Strip, the Israeli forces killed 4 Palestinian civilians, including 3 children, while another civilian succumbed to his wounds. Moreover, the Israeli forces wounded 115 others, including 26 children, 5 women, 4 journalists and 3 paramedics. Fifteen of those wounded sustained serious wounds. In the West Bank, the Israeli forces wounded 10 civilians, including 4 children and a journalist. In the Gaza Strip, in a new car crime, Israeli forces killed 2 Palestinian civilians and wounded 23 others, including 2 children in a series of airstrikes targeting an uninhabited al-Katiba building, which is located next to a public park in a densely populated area and government and civil institutions in the center of Gaza City. 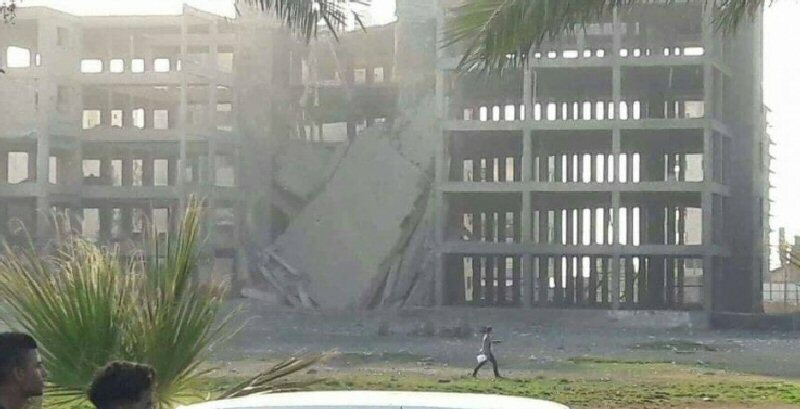 PCHR indicates that these airstrikes came in light official Israeli threats as the Israeli forces’ spokesperson Avichai Adrei stated that the Israeli army will conduct more raids in the Gaza Strip as long as it is needed. He also displayed photos of the 2014 Israeli Offensive on the Gaza Strip, pointing out for the possibility of repeating their scenario. The Israeli forces’ spokesperson send a message through his page early today to the Gaza Strip population to “stay away from any building, infrastructure that serves the terrorist parties, any person known as terrorist and every area where terrorist organizations operate. Save your lives and you were warned.” This indicates an Israeli intention to escalate the situation, although the majority of the victims who fall as a result of this offensive are Palestinian civilians. During the reporting period, while using the excessive force against the peaceful protesters along the Gaza Strip borders, the Israeli forces killed 2 Palestinian civilians and another one succumbed to wounds he sustained on 14 May 2018. Moreover, 115 civilians, including 24 children, 5 women, 4 journalists and 3 paramedics. Fifteen of those wounded sustained serious wounds. As part of targeting the border areas, during the reporting period, Israeli forces fired 11 artillery shells along the eastern borders of the Gaza Strip with Israel. As a result, 2 Palestinian civilians were wounded and 2 residential houses sustained partial damage. As part of the airstrikes, further to the above-mentioned crime resulted in the killing of 2 Palestinian civilians and wounding 23 others, Israeli warplanes launched 91 airstrikes targeting a group of Palestinian civilians, training sites belonging to the Palestinian resistance factions and empty lands. The Israeli forces claimed that the targeted civilians fired incendiary balloons. As a result, 4 Palestinian civilians were wounded. As part of targeting Palestinian fishermen in the Gaza Sea, the Israeli forces continued to escalate their attacks against the Palestinian fishermen, pointing out to the ongoing Israeli policy of targeting their livelihoods. During the reporting period, PCHR documented 6 shooting incidents at the fishermen, including 2 in the northern Gaza Strip, 2 in the central Gaza Strip and others in the southern Gaza Strip. In the West Bank, during the reporting period, the Israeli forces wounded 10 Palestinian civilians, including 4 children and a journalist. During the reporting period, Israeli forces conducted at least 77 military incursions into Palestinian communities in the West Bank and 4 similar ones into Jerusalem and its suburbs. During those incursions, Israeli forces arrested at least 61 Palestinians, including a child and a woman in the West Bank. Meanwhile, 5 other civilians were arrested in Jerusalem and its suburbs. In the Gaza Strip, at approximately 07:30 on 17 July 2018, the Israeli forces moved 100 meters into the east of al-Qarrarah village, east of Khan Yunis, south of the Gaza Strip. They levelled lands and repaired the border fence for several hours, before redeploying along the border fence between the Gaza Strip and Israel. As part of demolishing houses and civilian facilities, on 17 July 2018, the Israeli authorities’ bulldozers demolished a residential house, retaining walls and an agricultural barrack belonging to Saleh Abu Khudair in Shu’fat neighborhood, north of occupied East Jerusalem. The 100-sqaure-meter house was built few months ago to shelter Salah’s family, which is comprised of 6 members. It should be noted that the Israeli Municipality bulldozers demolished his house at the end of last February and his family became homeless, so he re-built the house and the Israeli authorities demolished it again. On the same day, Israeli forces demolished a retaining wall belonging to Ziyad ‘Awni in al-Tour village, east of occupied East Jerusalem, under the pretext of non-licensing. On 18 July 2018, the Israeli Municipality staff demolished a residential apartment in al-Tour neighborhood, east of occupied East Jerusalem’s Old City. The apartment was located in a 5-strorey residential building belonging to Abu Sbitan Family. On the same day, Jamal Hadiyah self-demolished his house in al-Thawri neighborhood, south of occupied East Jerusalem, to avoid paying the demolition costs. The Israeli Court issued a decision to demolish the 90-square-meter house and gave him until 26 July 2018 to implement the decision or the Israeli Municipality staff will demolish it and force him to pay the demolition costs estimated at NIS 100.000. As part of restrictions imposed on NGOs’ work, on 14 July 2018, Israeli forces raided Hind al-Hussainy College in al-Shaiekh Jarrah neighborhood, north if occupied East Jerusalem and prevented holding the fourth academic conference entitled: “ The Islamic Endowment (Awqaf) in Jerusalem”. The conference was organized by the Jerusalem Waqf and Heritage Reservation Society and the Islamic Supreme Committee – Jerusalem. On 17 July 2018, the Israeli Execution and Procedures Department staff raided an elementary school in Shu’fat neighborhood, north of occupied East Jerusalem’s Old City, and confiscated its contents under the pretext of accumulating taxes. The school administration said that the Israeli Execution and Procedures Department staff raided that school and confiscated devices and tool estimated at NIS 4.000, under the pretext of accumulating debts of “Arnona” property tax and not paying it from 2017. As part of demolishing civilians property, on 14 July 2018, Israeli forces demolished 3 roofs and an agricultural room in al-Marajem area, southwest of Duma village, southeast of Nablus, after a year of notifying it and a week of issuing the decision to demolish it. As part of settlers’ attacks against Palestinian civilians and property, on 13 July 2018, hundreds of settlers, using dozens of buses, moved into ‘Ortah village, southeast of Nablus, under the Israeli forces’ protection. The Israeli settler performed their religious rituals in places that they claim to be religious shrines located on the village’s outskirts. On the same day, a group of Israeli settlers sneaked into the outskirts of ‘Oreef village from the eastern side. They set fire to 2 Plaestinian vehicles belonging to Ziyad ‘Abdul ‘Aziz Jameel Shehadah. The 2 vehicles were parking in the house yard, during which the settlers sneaked into the house, poured a flammable material at the vehicles and then set fire to them. Moreover, they wrote slogans in Arabic (Be aware( and draw the Star of David below the written slogan. The 2 vehicles caught fire before extinguishing them by the village residents. On 16 July 2018, a group of Israeli settlers from “Leshim “ settlement established in the lands of Dir Balout village, west of Salfit, levelled 82 dunums. The settlers demolished 100 olive trees in favor of the abovementioned settlement. The levelled land belong to Na’iem Rushdi Jabbarah and Idrees Jabbarah ‘Abdullah, from the village. On 17 July 2018, a group of Israeli settlers from “Yitzhar“ settlement established in the lands of ‘Asirah Qabaliyiah village, south of Nablus, attacked the outskirts of ‘Asirah Qabaliyiah village from the eastern side, under the Israeli forces’ protection. The Israeli settlers burned 80 olive trees. The attack resulted in smashing the windows of 4 vehicles parked in front of their owners’ houses. At approximately 16:00 on Friday 13 July 2018, thousands of civilians swarmed to the Return encampments established by the Supreme National Authority for the Great March of Return and Breaking Siege, east of Malakah intersection, east of al-Zaytoun neighborhood, east of Gaza City in the 16th consecutive Friday titled “Loyalty to Khan al-Ahmer Friday”. The activities included raising flags, chanting national slogans, setting fire to tires and flying kites. Though the demonstrations were fully peaceful, Israeli forces stationed behind the border fence between the Gaza Strip and Israel deliberately and randomly fired live and rubber bullets and tear gas canisters at them. 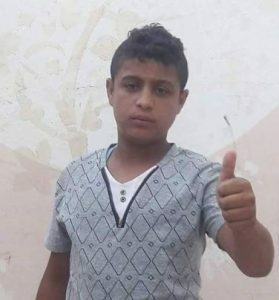 As a result, ‘Othman Rami Jawad Heles (14), from al-Shuja’iyah neighborhood, east of Gaza City, was hit with a live bullet that entered the chest and exited the back, causing his immediate death. Moreover, 32 civilians, including 8 children and a woman, were hit with live bullets and its shrapnel and tear gas canisters. 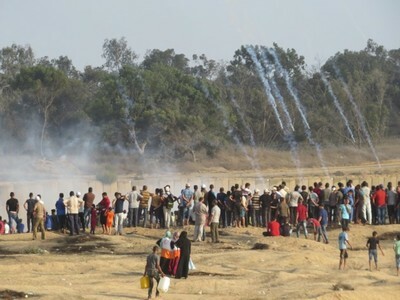 Around the same time, hundreds of civilians swarmed to the Return encampments established by the Supreme National Authority for the Great March of Return and Breaking Siege, 400 meters away from the border fence between the Gaza Strip and Israel, east of al-Buraij in the central Gaza Strip. Hundreds of young men, children and women approached the border fence, set fire to tires and threw stones at Israeli soldiers. The Israeli forces stationed behind sand barriers and military vehicles fired live bullets and tear gas canisters at the participants. The clashes continued until approximately 20:00. As a result, 27 civilians, including 3 women, 4 children, 3 paramedics and a freelance journalist, who received medical treatment on the spot, were wounded. Two of paramedics work at Palestine Red Crescent Society (PRCS) while the third works at the Medical Services. Sixteen of the wounded civilians were hit with live bullets and its shrapnel and 11 were directly hit with tear gas canisters. The wounded civilians were transferred to al-Aqsa Hospital in Deir al-Balah. Doctors classified the injury of 2 civilians as serious and one of them was transferred to al-Shifa Hospital in Gaza City. The other civilians’ injuries were classified between minor and moderate. 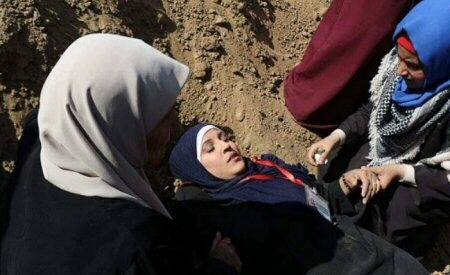 The Israeli forces targeted the civilians’ gathering in camps. 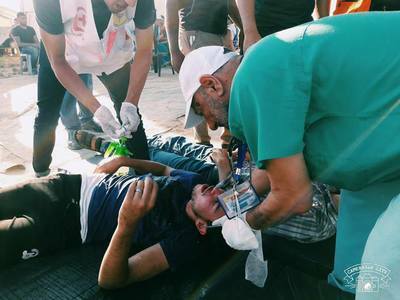 As a result, a number of medical staffers and dozens of civilians suffered tear gas inhalation. Some of them received medical treatment on the spot while others were taken to al-Aqsa Hospital in Deir al-Balah. At approximately 16:00, hundreds of Palestinians swarmed to the Return encampments, east of Khuza’ah village, east of Khan Younis in the southern Gaza Strip to participate in the demonstrations organized by Supreme National Authority for the Great March of Return and Breaking Siege. The number of protestors increased at approximately 16:30, as the participants, including men, elderlies, women and children, gathered inside and outside the encampment’s yard and raised flags, chanted national slogans and flew dozens of kites and balloons as dozens of them approached the border fence between the Gaza Strip and Israel and set fire. A number of them attempted to throw stones at Israeli forces and remove the barbed wire fence established by those forces on the Palestinian lands 30-50 meters away from the main border fence. The Israeli forces stationed behind hills, sand barriers, military vehicles and their vicinity sporadically opened fire and fired tear gas canisters at the protestors and at the area behind them. An Israeli drone also fired tear gas canisters amidst the protestors and near the area where the ambulances were stationed, 250 meters away from the border fence. The shooting continued until approximately 20:00. As a result, 20 civilians, including 2 children, were hit with live bullets and tear gas canisters. The wounded civilians were taken to the field hospital and then transferred to Nasser, Gaza European and Algerian Hospitals in Khan Younis. Doctors classified the injury of 3 civilians as serious. At approximately 06:15 on Saturday, 14 July 2018, medical sources at Nasser Hospital announced the death of Mohammed Nasser Mohammed Shurab (18), from Khan Younis after being hit with a live bullet to the chest. At approximately 18:22, dozens of civilians suffered tear gas inhalation and they received medical treatment on the spot and at the field hospital while others were transferred to hospitals due to suffering from suffocation and seizures. Abdul Karim Hasan Abdullah Hamdounah (28) from Jabalia and works at Palestine Live Agency was hit with live bullet shrapnel to the right thigh. Nihad Khalil Mohammed Abdul Nabi (25) from Jabalia and works at Palestine Live Agency was hit with a live bullet to the left leg. Anas Jamal Mahmoud al-Sharif (22) from Jabalia and works at Shamal Online Agency was hit with a tear gas canister to the left shoulder. Around the same time, thousands of Palestinian protestors swarmed to the encampments established by the Supreme National Authority for the Great March of Return, 300 meters away from the border fence between the Gaza Strip and Israel, east of east of al-Shawkah village, east of Rafah in the southern Gaza Strip. A number of them approached the border fence, flew kites, set fire to tires and threw stones at Israeli soldiers stationed behind sand barriers along the border fence. The soldiers fired live bullets and tear gas canisters at them. The clashes continued until approximately 20:00. As a result, 18 civilians, including 6 children and a woman, were wounded. Thirteen of them were hit with live bullets and its shrapnel and 5 others were directly hit with tear gas canisters. The wounded civilians were taken to the field hospital in the Return camp and then transferred to Abu Yusuf al-Najjar Hospital in Rafah. Doctors classified the injury of 2 civilians as serious. 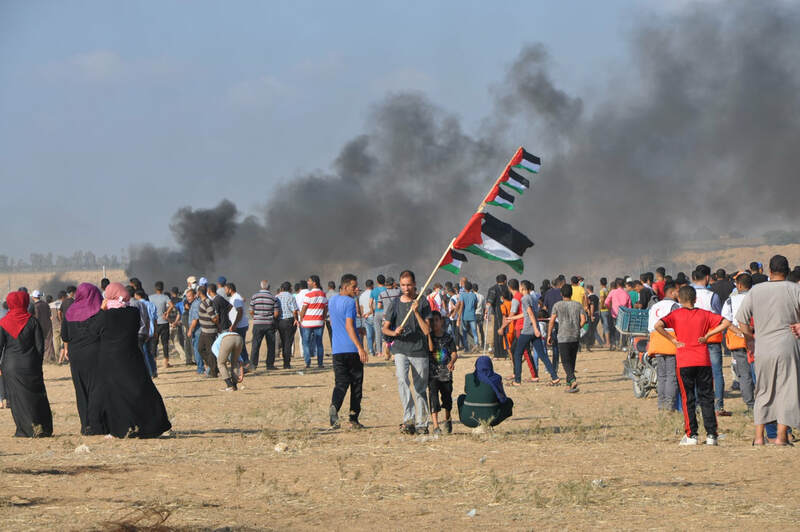 At approximately 18:00 on Saturday, 14 July 2018, Israeli forces stationed behind the border fence with Israel adjacent to the Return encampment, east of Khuza’ah village, east of Khan Younis, fired live bullets and tear gas canisters at a group of civilians who approached the border fence, set fire to tires and protested in the area in conjunction with a celebration for Hamas Movement inside the camp, during which they launched their summer camps. As a result, many civilians suffered tear gas inhalation and they received medical treatment on the spot. On Tuesday, 17 July 2018, medical sources announced the death of Samer Dahoud Mahmoud al-Shubaki (22) from al-Daraj neighborhood in Gaza City, succumbing to his previous wounds. Al-Shubaki was wounded on 14 May 2018after being hit with a live bullet to the neck, causing a Quadriplegia for him by the Israeli forces during his participation in the March of Return and Breaking Siege in Malakah area, east of al-Zaytoun neighborhood, east of Gaza City. It should be noted that al-Shubaki was receiving medical treatment in an Israeli hospital due to his serious injury until his death was announced. At approximately 13:30 on Friday, 13 July 2018, a group of Palestinian civilians moved from Kufor Qaddoum village, northeast of Qalqiliyah, to the eastern entrance to the village, which has been closed for 15 years in favor of the entrance to “Kedumim” settlement established on the village lands. The protestors chanted national slogans demanding end of occupation, condemning the U.S President Donald Trump’s decision to recognize Jerusalem as the capital of Israel and condemning the Israeli forces’ crimes against Palestinian protestors along the eastern border of the Gaza Strip within “The Great March of Return and Breaking the Siege” activities. Several representatives of national factions and representatives of National Action Factions in the north of the West Bank and a number of foreign and Israeli activists. Israeli soldiers fired live and rubber bullets, sound bombs and tear gas canisters at them. As a result, Nidal Shafiq Taher Eshtiah (49), a journalist at the Chinese News Agency, was hit with a rubber bullet to the left leg, though he was wearing a Press clearly marked uniform. At approximately 17:00 on Saturday, 14 July 2018, a group of civilians organized a similar demonstration at the eastern entrance to Kufor Qaddoum village. The Israeli forces opened fire at the participants. As a result, a 28-year-old civilian was hit with a rubber bullet to the left eye. At approximately 13:00 on Thursday, 12 July 2018, Israeli forces arrested Islam ‘Abdullah Mohamed ‘Ali (23) while he was near al-Timthal al-Abiyag area in al-Shaiekh Jarrah neighborhood, north of occupied East Jerusalem. The Israeli forces then took him to an investigation center. At approximately 19:00 on Sunday, 15 July 2018, Israeli forces moved into Hizmah village, northeast of occupied East Jerusalem. They raided and searched a house belonging to Ahmed ‘Adel Abu Shalhoub (24) and then arrested him. At approximately 21:00 on the same day, around 14 Israeli military vehicles accompanied with a large number of Israeli soldiers moved into al-Ram village, north of occupied East Jerusalem. They closed the village’s main street in the vicinity of al-Shuhada square. Moreover, they heavily fired tear gas canisters and sound bombs and then raided dozens of shops looking for youngsters. 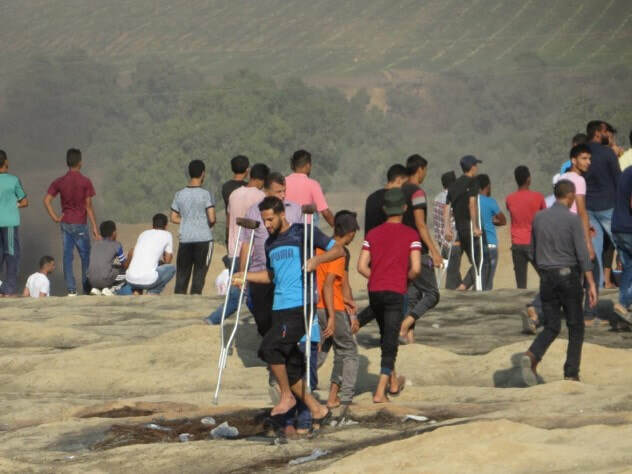 During which, dozens of Palestinian young men gathered in the area and threw stones and empty bottles at the soldiers, who fired rubber bullets at them. The Israeli forces later withdrew and no injuries or arrests were reported among the Palestinian civilians. At approximately 06:00 on Monday, 16 July 2018, Israeli forces moved into Karoum Qamar in Silwan village, south of occupied East Jerusalem’s Old City. They raided and searched a house belonging to a former prisoner Basil Harbi al-‘Abasi (27) and then arrested him. At approximately 01:00 on Wednesday, 18 July 2018, Israeli forces moved into Sho’fat refugee camp, north of occupied East Jerusalem’s Old City. They raided and searched houses, from which they arrested ‘Omar Fawzi Muhassin (33) and Mahmoud Sa’di al-‘Adween (26). On Monday, 16 July 2018, Israeli forces ordered Jamal Hadiyah to vacate his house in al-Thawri neighborhood, south of occupied East Jerusalem, as a prelude to demolish it. Jamal said that he was forced to vacate his house after receiving a demolition notice from the Israeli Municipality last week. He also said that his family is comprised of 6 members living in the house 30 years ago. The Israeli Municipality claimed that the house is not licensed. He added that the Israeli Municipality notified him 4 years ago, so he hired a lawyer to follow- up the case and get a license and paid a lot of money, but in vain. Jamal confirmed that he vacated his house on the same day in order to self-demolish his house and not avoid the demolition costs, which is estimated at over NIS 100.000. On Wednesday, 18 July 2018, Jamal self-demolished his house to avoid paying the demolition costs. It should be noted that the Israeli Municipality forced 3 Palestinians from Jerusalem to self-demolish their houses in the last June. At approximately 09:00 on Tuesday, 17 July 2018, Israeli bulldozers demolished a wall surrounding a plot of land belonging to Ziyad ‘Awni ‘Alqam in al-Tour village, east of occupied East Jerusale, under the pretext of non-licensing. Eyewitnesses said that the Israeli Municipality staff accompanied with Israeli forces and a bulldozer moved into al-Tour village and then demolished a facility near al-Zaytounah military checkpoint. They also demolished a wall surrounding a plot of land belonging to Ziyad ‘Awni ‘Alqam. The eyewitnesses also said that the Israeli Municipality staff denied Palestinian civilians and journalists’ access to area, which was previously stormed. In the same context, on Tuesday, the Israeli authorities’ bulldozers demolished a house belonging to Salah Abu Khudair in Shu’fat neighborhood, north of occupied East Jerusalem’s Old City. Salah said that the Israeli Municipality staff accompanied with Israeli soldiers and a bulldozer moved into the neighborhood, completely surrounded his house and then demolished the house, retaining walls and an agricultural barrack. He added that the 100-sqaure-meter house was built few months ago to shelter his family, which is comprised of 6 members. Salah also said that the Israeli bulldozers demolished his house at the end of last February and his family became homeless, so he re-built the house and the Israeli authorities demolished it again. Salah said that the soldiers didn’t allow him to vacate the barrack agricultural content. On Wednesday, 18 July 2018, Israeli police officers accompanied with the Israeli Municipality staff from occupied East Jerusalem moved into al-Tour neighborhood, east of occupied East Jerusalem’s Old City. The Israeli forces surrounded a 5-strorey residential building belonging to Abu Sbitan Family. The Israeli Municipality staff raided the 5th floor and then demolished a residential apartment with hand tools. At approximately 10:30 on Saturday, 14 July 2018, Israeli forces raided Hind al-Hussainy College in al-Shaiekh Jarrah neighborhood, north if occupied East Jerusalem and prevented holding the fourth academic conference entitled: “ The Islamic Endowment (Awqaf) in Jerusalem”. The conference was organized by the Jerusalem Waqf and Heritage Reservation Society and the Islamic Supreme Committee – Jerusalem. Eyewitness said to PCHR’s fieldworker that the Israeli police raided Hind al-Hussainy College, which belongs to al-Quds University, before opening the fourth academic conference entitled: “The Islamic Endowment (Awqaf) in Jerusalem”. He also said that the Israeli forces prevented participants from entering or exiting the hall, checked their IDs and then arrested the Palestinian business man, Muneeb Rashid al-Masri (84). Muneeb was taken to al-Maskobiyia investigation center in West Jerusalem for interrogation. The Israeli forces hanged a paper, in which Gilad Erdan, Minister of Internal Security, ordered to ban holding the conference in Jerusalem or in any other places in Israel, claiming that the conference was funded by the PA. Gilad Erdan said that he was informed about holding a conference sponsored by the PA on Saturday and Sunday in Hind al-Hussainy College in Jerusalem, without a prior permit. He pointed out that he banned the holding of the conference. On Tuesday, 17 July 2018, the Israeli Execution and Procedures Department staff raided an elementary school in Shu’fat neighborhood, north of occupied East Jerusalem’s Old City, and confiscated its contents under the pretext of accumulating taxes. The school administration said that the Israeli Execution and Procedures Department staff raided that school and confiscated devices and tool estimated at NIS 4.000, under the pretext of accumulating debts of “Arnona” property tax and not paying it from 2017. The staff gave the school administration 2 weeks to pay the debts estimated at NIS 21.000 or they will confiscated all the school’s furniture and devices. Sameer Jebreel, Director of the Education Ministry in occupied Jerusalem, said that members from “Arnona” Property Tax Department accompanied with Israeli police officers raided the school and checked its contents before confiscating PCs, printers and cameras. He added that the Israeli Municipality Taxes Department calls upon the school to pay NIS 21.000 as a tax on the property, which serves around 230 students from Jerusalem. Jebreel said: “We received payment notices, but this is illegal, so we did not respond to them. We offer a free education to the children and our schools are non-profit organizations.” Jebreel considered the Israeli demands as a racial discrimination, especially the Israeli schools are exempt from paying taxes. At approximately 12:30 on Sunday, 14 July 2018, Israeli forces accompanied with a jeep of the Israeli Civil Administration, another jeep with an Israeli registration plate carrying 4 workers and a bulldozer moved into al-Marajem area, southwest of Duma village, southeast of Nablus. The workers vacated the contents of an agricultural room and 3 roofs before demolishing them completely. It should be noted that the owners of the agricultural room and roofs were received a demolition notice a year ago and the decision to demolish them was issued a week ago. The 3 roofs, which was built 200 years ago on an area of 56 square meters, belong to Musalam Ma’rouf Saleem Musalam, from Talfeet village, southeast of Nablus. The roofs were used as a dwelling and a store for plantings. The 16-square-meter agricultural room, which was built 2 years ago, belongs to Ameen Saleem Shurabi, from Jerusalem suburbs. On Monday, 16 July 2018, Israeli authorities distributed dozens notices to confiscate a 200-dumun hill in al-Khadir village, south of Bethlehem. Ahmed Salah, a Coordinator in Colonization and Wall Resistance Commission, said that the Israeli forces distributed dozens notices for the owners of the targeted lands in Qazandah Mount. The notices included: “You are required to lift your hand over the land and restore it to its pre-existing condition within 45 days. In case you do not do so, the competent authority will make the eviction and within 30 days you may submit a written text to the person responsible for absentee property explaining your request against the eviction decision and providing a map showing the total area that you claimed to have a right on it backed by any documents. You have the right to object before the Military Objections Committee of the Ofer Military Court.” Salah clarified that notices were thrown in the evening at the targeted land, aiming at confiscating them and annexing them to nearby settlement outposts belonging to “Efrat” settlement. He explained that what was mentioned in the notifications is fake allegations such as retuning the land as it was, even though the owners have documents from their parents and grandparents that proved their ownership to these lands. He stressed that the issue is very serious and if the confiscation is implemented, this will lead to the confiscation of other large areas of lands in favor of settlement outposts in a clear reduction of the land owned by the legitimate owners of al-Khadir village. At approximately 00:30 on Thursday, 13 July 2018, hundreds of settlers, using dozens of buses, moved into ‘Ortah village, southeast of Nablus, under the Israeli forces’ protection. The Israeli settler performed their religious rituals in places that they claim to be religious shrines located on the village’s outskirts. In the morning, the Israeli forces secured the settlers exit from the village and no further incidents were reported. At approximately 03:30 on Friday, 13 July 2018, a group of Israeli settlers from “Yitzhar“ settlement established in ‘Oreef village’s lands, south of Nablus, sneaked into the outskirts of ‘Oreef village from the eastern side. They set fire to 2 Plaestinian vehicles belonging to Ziyad ‘Abdul ‘Aziz Jameel Shehadah. The 2 vehicles were parking in the house yard, during which the settlers sneaked into the house, poured a flammable material at the vehicles and then set fire to them. Moreover, they wrote slogans in Arabic (Be aware( and draw the Star of David below the written slogan. The 2 vehicles caught fire before extinguishing them by the village residents. At approximately 10:00 on Monday, 16 July 2018, a group of Israeli settlers from “Leshim“ settlement established in the lands of Dir Balout village, west of Salfit, levelled 82 dunums, which were called as “Bab al-Marj”. The settlers demolished 100 olive trees in favor of the abovementioned settlement. The levelled land belong to Na’iem Rushdi Jabbarah and Idrees Jabbarah ‘Abdullah, from the village. “Leshim “ settlement is an example of what the Palestinian countryside is suffer from. On 28 June 2018, a wastewater treatment plant was established in the western side if the abovementioned settlement, which resulted in enormous damage to the agricultural seasons in the village such as squash, garlic and okra. Most of the village residents rely on these crops. At approximately 13:00 on Tuesday, 17 July 2018, a group of Israeli settlers from “Yitzhar“ settlement established in the lands of ‘Asirah Qabaliyiah village, south of Nablus, attacked the outskirts of ‘Asirah Qabaliyiah village, under the Israeli forces’ protection. The Israeli settlers threw stones at Palestinian civilians’ houses in Bir ‘Asirah area and set fire to the lands. As a result, 30 olive trees, which belong to Mohamed Husni Motleq Hamdan, were burnt; while 50 other olive trees, which belong to Jaber ‘Awad ‘Abdul Latif Yaseen, were burnt as well. The attack resulted in smashing the windows of 4 vehicles parked in front of their owners’ houses. Two of vehicles’ owners were identified as Majdi Ibrahim Makhlouf and ‘Abed al-Baset Mohamed ‘Abed al-Rahman. Fully detailed document available at the official webiste for the Palestinian Centre for Human Rights (PCHR). Photo: Journalist Madeline Al-Aqraa after she was wounded in the field, in the town of Khuza’a, east of Khan Younis. The attacks against media freedoms in Palestine continued to rise during June of 2018, and have experienced a new upsurge. Totalling 62 attacks, they reflect an increase of five cases, as opposed to compromises observed during May. June witnessed 33 violations from Palestinian authorities, and 29 were committed by Israeli occupation forces, in the occupied West Bank and Gaza Strip. It should be noted that the number of Palestinian violations almost rarely exceeds the number Israeli violations, PNN reported for MADA. Female journalists were not spared any of these serious and broad assaults. The number of female journalists who were affected by these assaults, during last month, totaled to 13 — 8 of whom were exposed to assaults by Palestinian authorities in the West Bank and Gaza Strip. Five female journalists were targeted by occupation forces in the West Bank and Gaza Strip, one of them was taken into custody, while four were injured by rubber-coated metal bullets and gas bombs, while they were covering events in Gaza and the West Bank. During June, the Israeli occupation committed 29 assaults, most of which were classified as serious or even sexual assaults on media freedoms and journalists. A number of these violations fall under the category of collective and “combined assaults”, which affected more than one journalist, with more than one type of assault being committed in the same moment. 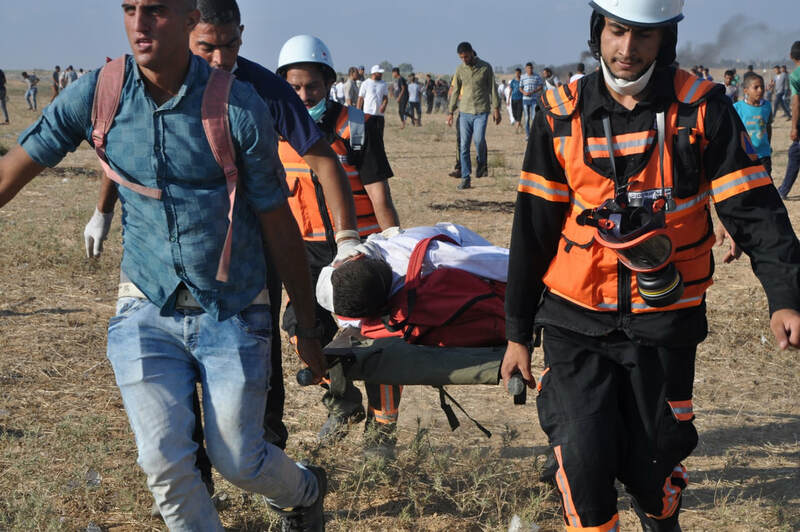 Throughout he month, Israel continued to target journalists with live ammunition. It is worth noting that three journalists were injured by live bullets, namely: Mohammad Abdelraziq Albaba, a photographer at Agence France-Presse AFP, who was injured with gunshot in his foot while covering the events of the Great March of Return taking place in Abu Safiya, east of Jabalia refugee camp. A photographer fromTurkish Agency “Anatolia”, Ali Hassan Musa Jadallah, who was shot in the palm of his right hand while covering the march to east of Khan Younis, and freelance journalist, Haitham Adnan Madoukh (working for the local Sky Press Agency), who was wounded by a gunshot through his left leg, below the knee, as he was covering the events of the march in the east of Gaza, which caused him a severe laceration in the bones. Furthermore, two other journalists were injured with gas bombs fired directly at them, while a female journalist was injured with a rubber-coated bullet, in addition to the suffocation of dozens of journalists, which resulted in four cases of fainting and severe respiratory distress, and required immediate treatment and hospitalization at health centers, for various periods of time. Additionally, the Israeli army and occupation intelligence services detained a total of five journalists, in June. An Israeli court prevented the Director of Elia for Media, Mr. Ahmad Hussein Al Safadi, from attending or covering any public event in Jerusalem for one month, after being detained by Israeli police. Israeli police and intelligence went so far as to raid an Iftar ceremony organized by the Chamber of Commerce, for the journalists, at the Ambassador Hotel in Jerusalem, and dispersed 30 journalists who attended the ceremony. Palestinian violations have reportedly witnessed a remarkable rise, jumping from four violations, in May, to at least 33, during June, with 10 occurring in the Gaza Strip and 23 in the West Bank. The largest portion of these violations, which took place during June, are classified as serious violations. On top of this were the widespread violations committed by Palestinian security agents dressed in civilian clothes, against journalists who were covering a peaceful sit-in, in downtown Ramallah, on 13 June, 2018. This is in addition to violations similar in essence and form committed, by members of Hamas and security agents in civilian clothes, against both male and female journalists who were covering the sit-in, which was taking place at Al-Saraya Square, downtown Gaza, on 18 June, 2018. This included physical assaults, using sticks and hands, against a number of journalists, as well as the seizure of some tools and the destruction others, deleting media recorded by the journalists, in addition to preventing them from media coverage. This is also in addition to the widespread and collective assaults which affected those taking part in both sit-ins (Ramallah and Gaza). It should be noted that these sit-ins were taking place to protest against the failure to pay the salaries of Palestinian Authority staff in the Gaza Strip. The Palestinian Centre For Haman Rights (PCHR): On Friday, 13 July 2018, using excessive lethal force against the peaceful protesters in eastern Gaza Strip for the 16th Friday in a row, Israeli forces killed a Palestinian civilian and wounded 95 other civilians, including 17 children, 3 women, 2 paramedics and 2 journalists, in addition to dozens suffering tear gas inhalation. Demonstrations organized today were in solidarity with residents of al-Khan al-Ahmar Bedouin Community and on the occasion of 100 days passed on Great March of Return. Upon a Decision by the highest political and military echelons, the Israeli forces continued to use excessive force against the peaceful protesters, who posed no threat to the life of the soldiers. Dozens of Israeli Forces’ snipers continued to position on the hills, behind the sand barriers and in military jeeps along the border fence in front of the peaceful demonstrations in the eastern Gaza Strip. According to PCHR’s fieldworkers, the number of youth gatherings near the border fence augmented to reach dozens who set fire to tires and attempted to throw stones at the Israeli forces. 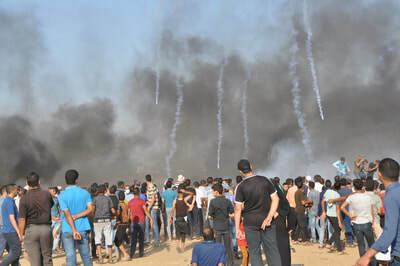 The Israeli snipers deliberately and selectively opened fire at the participants in the peaceful demonstrations which included thousands of civilians in different areas in the eastern Gaza Strip. 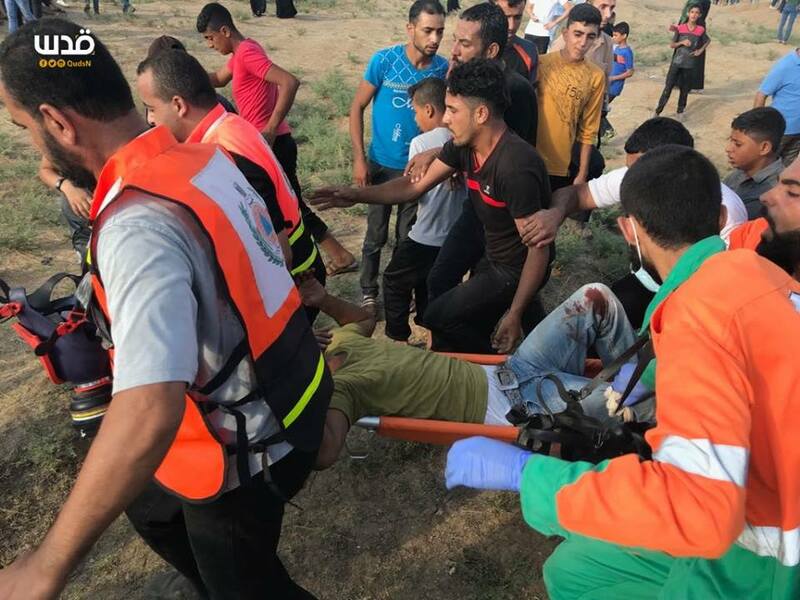 The Israeli forces continued to target the medical personnel directly and deliberately as they wounded and targeted 2 of them with tear gas canisters, east of al-Buriej Camp. The Israeli forces widely used bursts of tear gas canisters and from drones, military jeep and soldiers’ rifles, targeting the center of the demonstrations and near the demonstrators near the border fence. As a result, many civilians were directly targeted and hit with tear gas canisters, causing serious injuries, while the gas coming of them made dozens suffer tear gas inhalation, fainting and seizures. Some of them were transferred to hospitals, including few so far receive medical treatment. 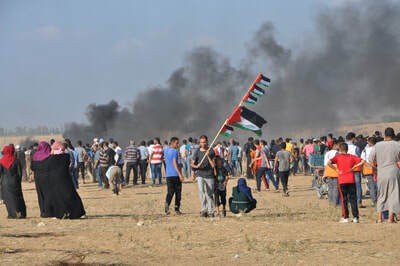 The demonstrations were as always fully peaceful, and PCHR’s fieldworkers did not witness weapons or armed persons even dressed in civilian clothes among the demonstrators, who were thousands of elderlies, women, children and entire families, demonstrating near the border fence and raising flags, chanting slogans and national songs, flying kites and burning tires. Journalists were again targeted with bullets and tear gas canisters, wounding 2 journalists in eastern Jabalia, north of the Gaza Strip. The Israeli unjustified and fallacious incitement against the peaceful demonstrations and encampments continues, perceiving the demonstration itself as danger. This hereby violates the right to peaceful assembly codified in all International instruments. At approximately 16:00, hundreds of civilians, including women, children and entire families, started swarming to 5 encampments established by the Supreme National Authority for the Great March of Return and Breaking Siege in eastern Rafah City; Khuza’ah in Khan Younis; al-Bureij in the Central Gaza Strip; Shija’eyah neighborhood in Gaza City; and eastern Jabalia in the northern Gaza Strip. The number of participants gradually increased, reaching a peak at approximately 16:30, in the five demonstration areas, and they were estimated at thousands of men, elderlies, women and children. They were inside and outside the encampment yards, raising flags, and chanting slogans and national songs in addition to flying kites and firing balloons, while hundreds of them, including children and women, approached the border fence, set fire to tires and attempted to throw stones at the Israeli forces. Moreover, the protestors removed the barbed wire fence established by the Israeli forces inside the Palestinian territories around 30-50 meters away from the main border fence. The Israeli shooting which continued until 20:00 resulted in the killing of ‘Othman Rami Hallas, 15, from Shija’eyah neighborhood in Gaza City. ‘Othman was with a live bullet to back while participating in the protests in eastern Gaza City. Moreover, 95 civilians, including 17 children, 3 women, 2 paramedics and 2 journalists, were wounded. In addition, hundreds suffered tear gas inhalation and seizures, including PCHR’s fieldworkers while covering the suppression of demonstrations, after Israeli forces fired tear gas canisters. PCHR condemns this new crime committed by the Israeli forces, believing it is as a result of Israel’s enjoying impunity thanks to the U.S. and so encouraging the Israeli forces to commit further crimes upon an official decision by the highest military and political echelons. PCHR emphasizes that continuously inflicting casualties, either killed or wounded, is unjustified and targeting and killing civilians, who exercise their right to peaceful assembly or while carrying out their humanitarian duty, using lethal force is a serious violation of the rules of intentional law and international humanitarian law. PCHR emphasizes that ongoing attacks against the Palestinian medical personnel, especially those working in the field, constitute a serious violation of the international human rights and humanitarian laws and the international standards regulating the protection rules of medical personnel, including paramedics, their vehicles and medical facilities. The serious violations and deliberate attacks against the medical personnel amount to war crimes according to the 1949 fourth Geneva Convention, particularly the scope of protection provided to them. PCHR believes that continuously targeting journalists while on duty with bullets and tear gas canisters proves that there is an Israeli policy to target journalists in order to prevent them from covering the Israeli suppression of the peaceful protestors, in violation of the rule of international humanitarian law. PCHR emphasizes that the demonstrations are fully peaceful and civilians have the right to raise their voices against the Israeli forces and closure and enjoy their right to return. Thus, PCHR stresses that Israel shall be held accountable and prosecuted through investigating with it into these crimes. PCHR also stresses that this ongoing policy by Israel violates the Rome STATUTE OF THE INTERNATIONAL CRIMINAL COURT (ICC) and Fourth Geneva Convention, and its practices qualify to war crimes. Thus, PCHR calls upon the ICC Prosecutor to open an official investigation into these crimes in addition to prosecuting and holding accountable all of those involved in issuing decisions and orders in the Israeli forces at the political and security level and those applying the orders. 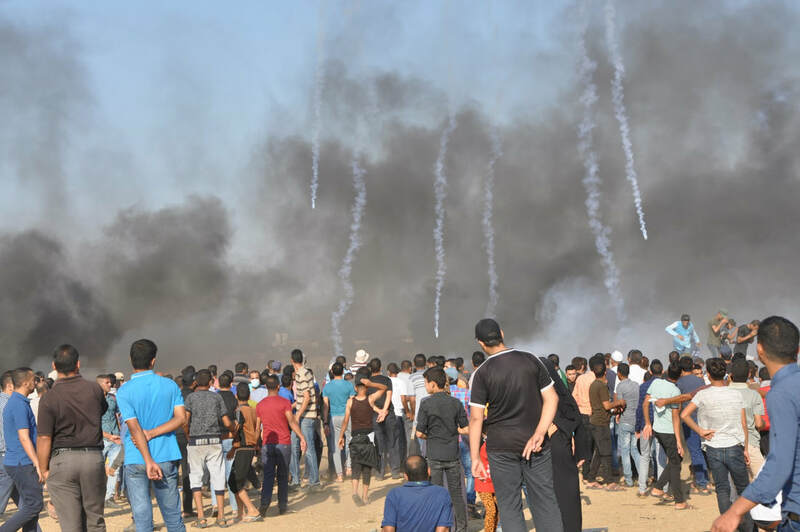 PCHR asks for the presence of international observers from the United Nations (UN) bodies in the Gaza Strip to make sure that these demonstrations are totally peaceful and even if the Israeli authorities denied their access to Gaza, they can observe from the Israeli side of the borders. PCHR calls for the prompt formation of an international commission of inquiry according to the UN Human Rights Council’s Resolution to investigate the crimes committed by the Israeli forces against unarmed civilians in the Return March activities. PCHR calls upon Switzerland, in its capacity as the Depository State for the Convention, to demand the High Contracting Parties to convene a meeting and ensure Israel’s respect for this Convention, noting that these grave breaches constitute war crimes under Article 147 of the same Convention and Protocol (I) Additional to the Geneva Conventions regarding the guarantee of Palestinian civilians’ right to protection in the occupied territories.